For some days now, many of us has been having difficulties connecting with Glo via one of the best VPN app of its time (Tweakware). But today I want to inform you that it is back and even better with Import Tweak method, whereby you can browse and download with this cheat if you are in an area where there is good network coverage. For the benefit of newbies wanting to know or use Tweakware for the very first time, I would have loved to tell you how Tweakware works and how it has saved many Nigerians and even other countries like Ghana from spending a lot of money purchasing data subscriptions. 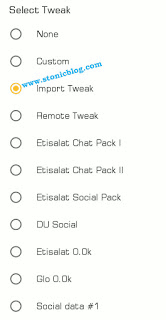 For those of you already familiar with the name Tweakware since the days of Etisalat Chat Pack, wouldn't need any tutorial(s) on how to use it, but rather download the required files and use. Please follow all instructions given below accordingly to get a positive outcome at the end of this tutorial. 5. Make sure you follow the instructions on the page carefully if you’re using the mobile or bank transfer option, once successful, your account will be upgraded in premium instantly. 1. Open your tweakware android application, click on Settings and select Account settings, input your premium account username and password respectively in the correct order. 2. 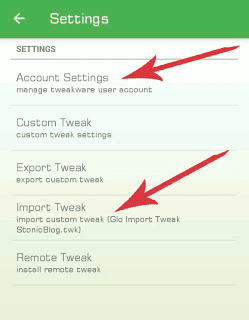 Go back to settings and click on Import Tweak, then navigate to the folder you saved the custom tweak you had just downloaded, click on it to import. You should see a success message if the import was successful. 4. Now select your preferred premium server (servers with a star icon) and click on Connect Button, it should connect in less than 20 seconds. Note: That stability and speed of this Glo free browsing depends on the network coverage in your location. Thank you very much Sunny... I'm blazing it and it's very fast and stable here in my location. More elbows to you.